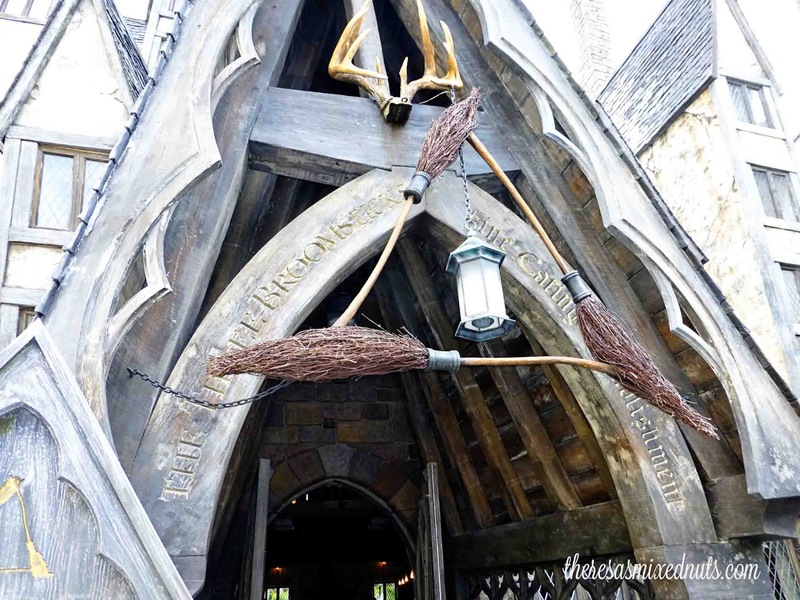 Earlier this week, I shared with you the fun activities to engage in at Wizarding World of Harry Potter's Diagon Alley. Today, I want to discuss the food options. The first trip we made, 2 years ago, we dined for lunch at The Three Broomsticks. Here you will find a nice mixture of dinner options that appeal to both British and American tastes. Shepherd's Pie, Fish and Chips, Ribs, Turkey Legs and Rotisserie Chicken are all on the menu. The prices seemed reasonable, and the portion sizes were fair. The bill for the 4 of us came to $70 for lunch with 4 Butterbeers. 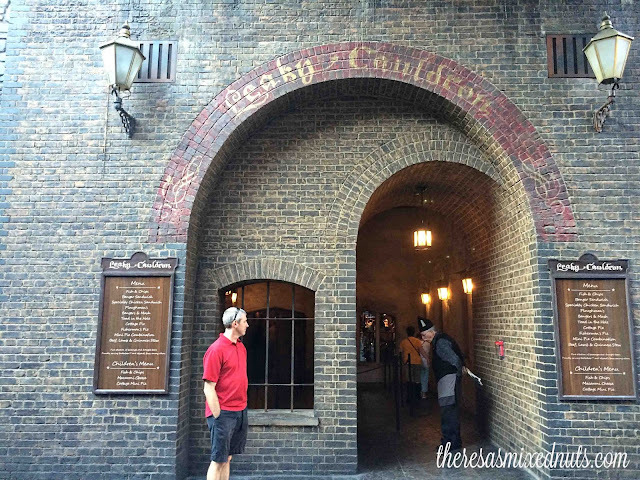 This trip we had lunch at The Leaky Cauldron. The Leaky Cauldron is really geared towards the British palette. 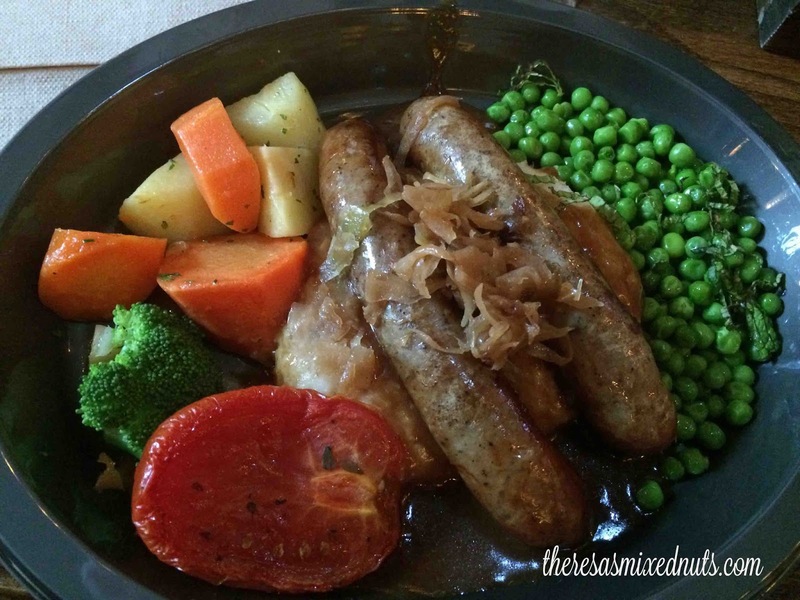 Bangers and Mash, Fish & Chips, Beef, Lamb & Guinness Stew, Cottage Pie and Toad in the Hole were some of the options. 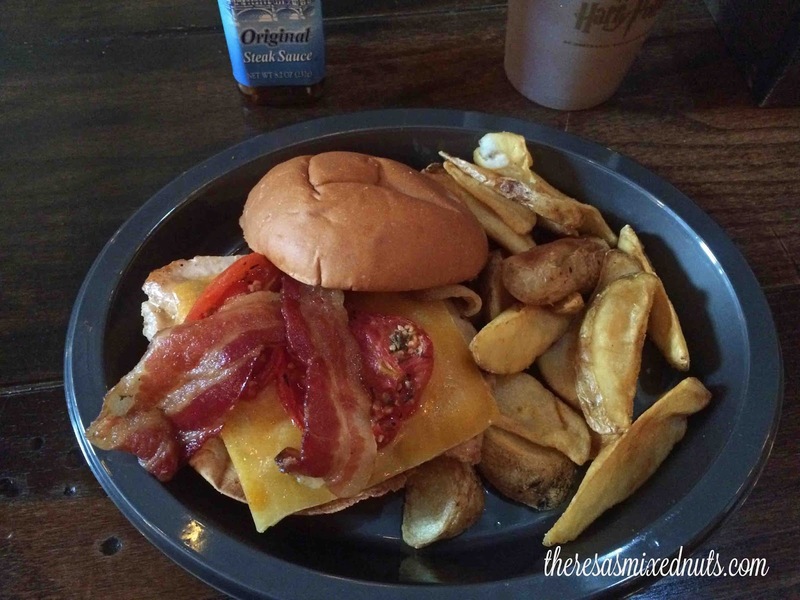 If you have picky eaters, I would not suggest taking them to The Leaky Cauldron. Allison was not pleased with the food options, and ended up settling for mac and cheese off the kid menu. In all honestly, Mariah didn't care for her beef stew, as it had way too many herbs mixed in, so I traded her my burger. You won't find any muggle type beverages on the menu either. If you are looking for a Coke, you'll be out of luck. The beverage options are Butterbeer, Pumpkin Juice, Lemon Squash, Fizzing Orange Juice and a selection of beers for the 21+ crowd. Again, the total was right around $70 for the 4 of us. There are carts around the park that sell cold Pumpkin Juice. We weren't sure what to expect, but had to try some. Mariah and I loved it, but Jason and Allison thought it was terrible. 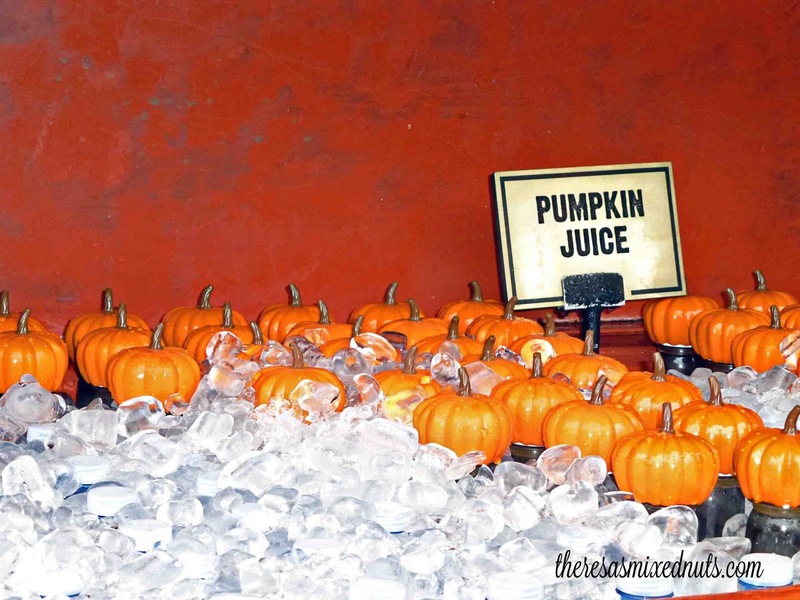 It almost takes like liquid pumpkin pie, and it is very sweet! We couldn't leave without a visit to Florean Fortescue's Ice Cream Parlour. 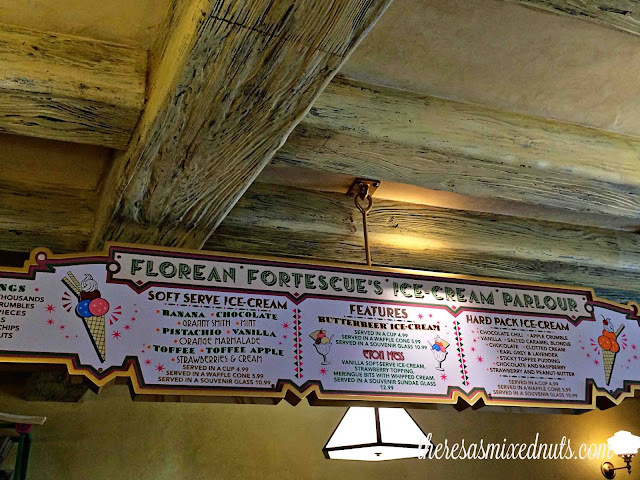 They have a wide assortment of ice cream flavors, and we were quite intrigued by some of the options. Chocolate Chili and Earl Grey & Lavender grabbed our attention, but we played it safe and stuck with the more traditional flavors. The Salted Caramel Blondie was delicious, but I'd say Mariah got the winning flavor when she went with the Butterbeer ice cream. It really was scrumptious! 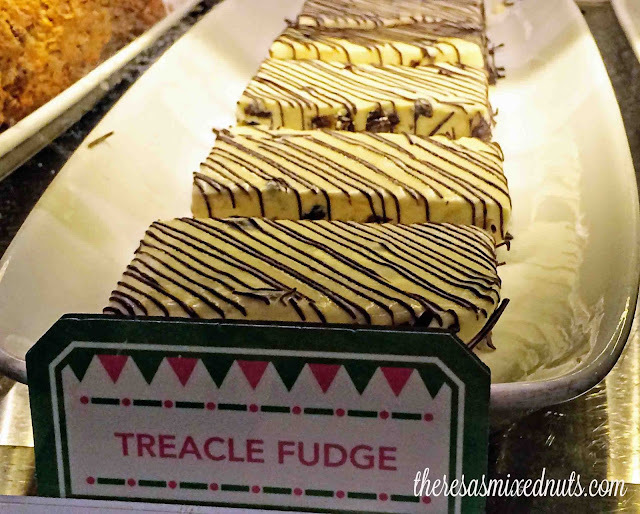 You can also pick up other Harry Potter Treats here, like Treacle Fudge! Yum! 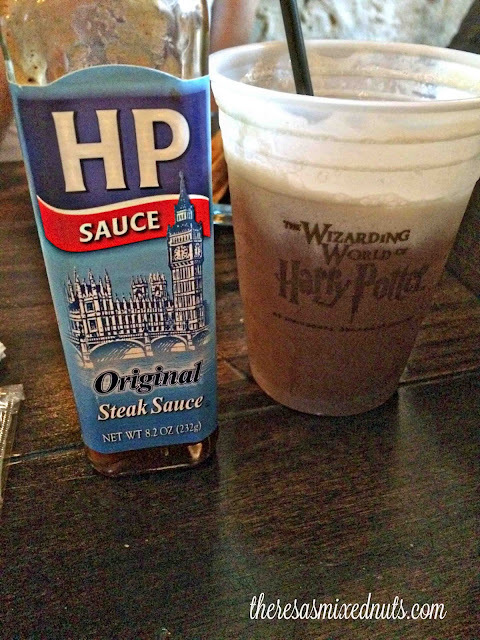 For any Harry Potter fan, I'd definitely recommend budgeting some vacation money to sample the food. The experience alone is worth it, I think! 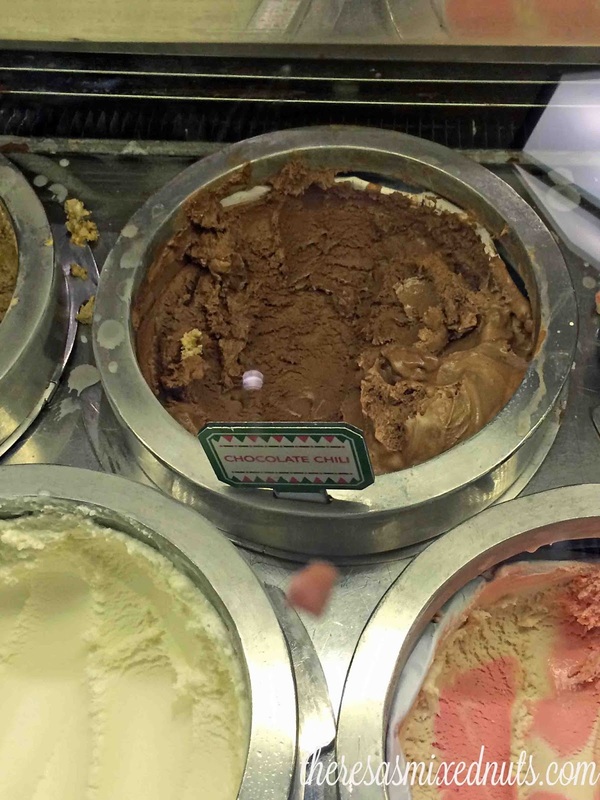 Would you be adventurous and try the Chocolate Chili or Earl Grey & Lavender Ice Cream? 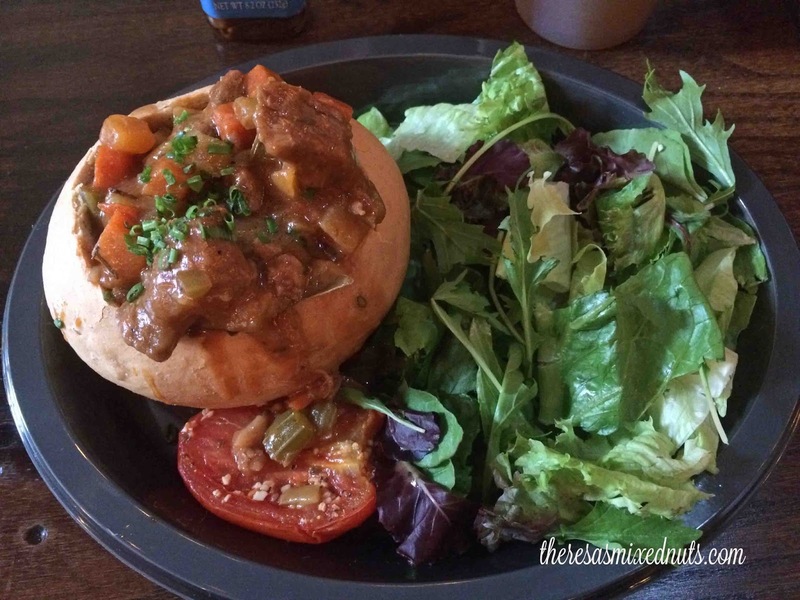 I ate at the Tree Broomsticks when I was there in March. Next time I will hit the Leaky Cauldron! That looks like so much fun. We've all read all the books and seen all the movies. This is the next step for us! I'm not sure about those ice creams but I would LOVE to take my husband there! I think he would really enjoy it! I would totally try the Earl Grey and Lavender ice cream! This looks like such a fantastic experience! those meals don't look nice to me :) but the fudge and those brooms do! Aren't those brooms neat? I'd like to get some for my house for Halloween! I bet you'd like the Earl Grey Ice Cream, Dezzy! my country of Vojvodina actually is leading producer of brooms :) Natural ones, we have tones of those wiry plants that grow around marshes and lakes which are used for brooms. My kids would die! So would I, for that matter. That looks like so much fun! That looks so good! Mica would flip over this! Do they sell those funky jelly beans that taste like Harry Potter flavors? I could see them being by the door. They aren't sold in the restaurants, but you can pick them up, along with a ton of other treats from the books at Honeydukes candy shop and The Weasley's Joke shop. Or, if you don't want to go all the way to FL, you can grab some for Mica at Barnes & Noble. I think they sell them for $3 or $4 there. I always pick Mariah a box up for her stocking. She gets such a kick out of them! My family would be crazy excited to go there. The food looks pretty good too! What a cool place. I'm loving your posts on your trip. My kids are looking over my shoulder and really wanting to go visit! 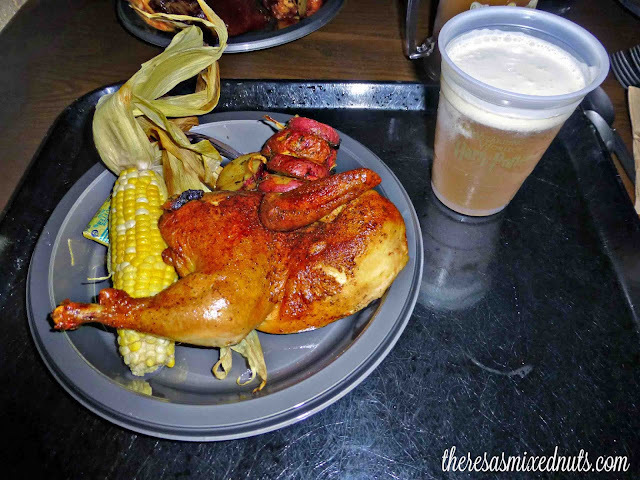 The food at both Harry Potter restaurants is great. I can never decide which one I want to eat at. I always end the day with Butterbeer or Chocolate Chili Ice Cream. I can't wait to go again this Sunday. I have been dying to go to the Wizarding World of Harry Potter. It's on my bucket list of places to go on vacation. I've never seen any of the films or read any of the books, but this themed restaurant seems like so much fun to visit!! 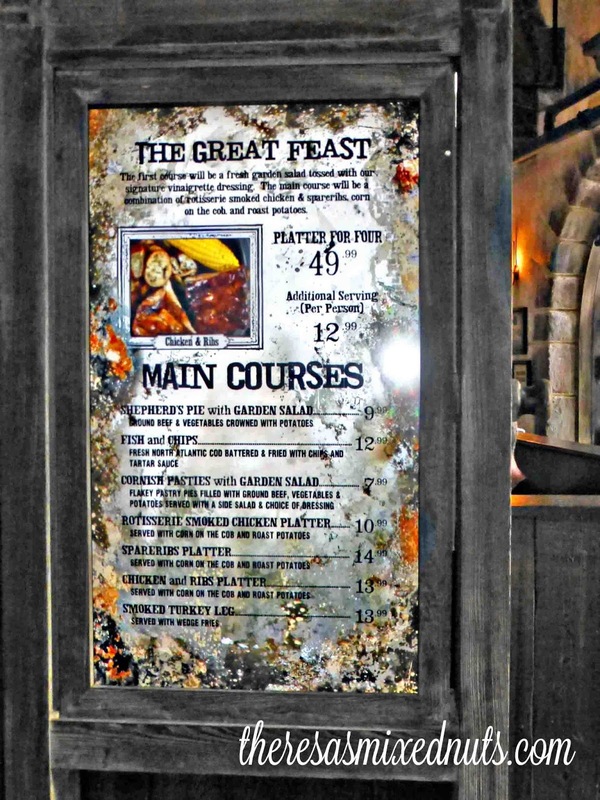 The food shown from The Leaky Cauldron doesn't look too appetizing to me but the other foods do. Someday, oh someday, I'm going to make a vacation out of spending several days at The Wizarding World of Harry Potter. British food is one of my favorites next to traditional Irish. I am always up for Shepherds Pie, Bangers n Mash and so much more. YUM! We definitely try new things so we'd try both types I am sure. It sounds like decent price for a tourist area. I can't wait to visit someday - you give such great insight on the eats! And that fudge looks yummy! I would love to visit the Wizarding World of Harry sometime soon! It would just be so much fun! This looks like a Harry Potter fan's dream! The food looks really yummy! Oh wow!! This would be a place my oldest Granddaughter would love to visit. Very unique. This sounds like a really fun place to visit! I would love to visit there someday.